The new X-10 from Mastercraft is designed and built to tackle all different watersports missions, from wakeboarding to water skiing to tubing. 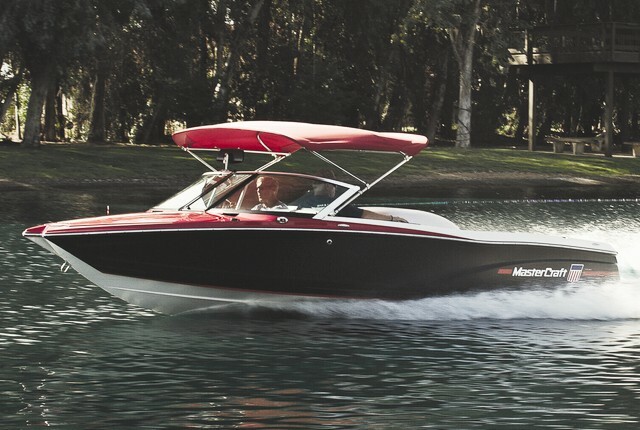 While the X Star dominates the headlines as MasterCraft’s premier wakeboard boat, further down the model line the X-2 serves as the company’s entry level model. 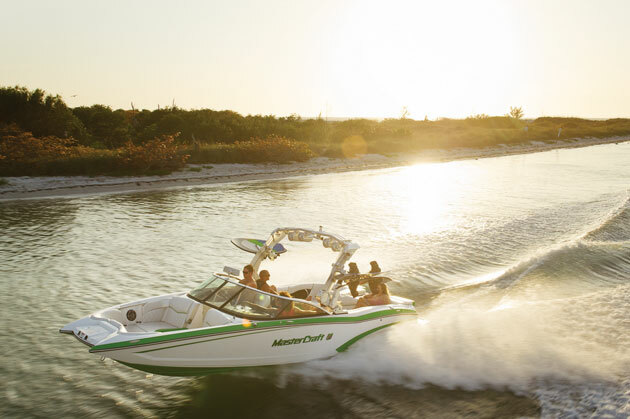 However, it’s important to take note one of MasterCraft’s newest offerings, the X-10, which debuted in January. 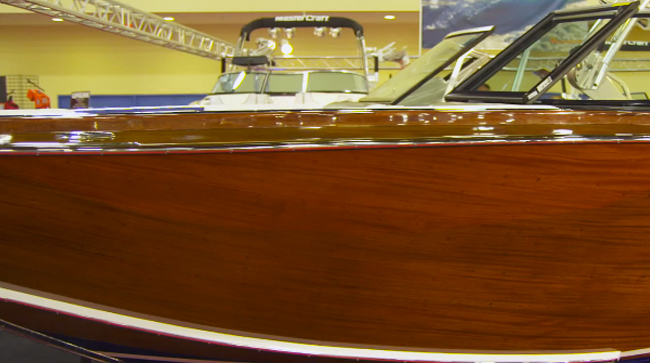 The MasterCraft X-10 falls into the middle of the line-up from this builder, but its no middle-weight. MasterCraft bills the X-10 as a dream machine, but it also could be considered a foot soldier that quietly gets the job done, and tackles any water sports mission you might have. Standard engine is an Ilmor 320-hp 5.7 liter V8 sourced from the GM parts shelf. There are optional engines from 6.0 liters to 7.4, but the standard engine has enough snort to do the job, and it keeps the price tag in check. The X-10 is a V-drive inboard, and it lends itself to rampy wakes, but the boat also delivers a reasonably flat wake for recreational slalom skiing. The X-10 comes with standard trim tabs on the left, right and center, so getting it to ride flat and fast for ski wakes is as easy as adjusting the tabs to a skier’s preference. Then you can store the settings in the memory of the digital display. A 4.3-inch screen is standard, with a seven-inch touch screen available as an option. Fill up the ballast tanks and you have a near-professional caliber wakeboard boat that’s also capable of throwing surf wakes. 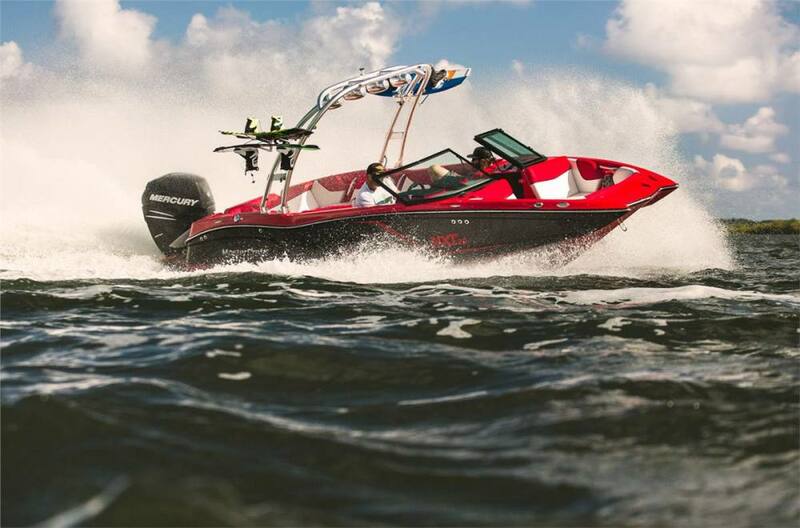 Of course, it’s great for pulling tubes and with those big wakes, tubers will love the big air-time. 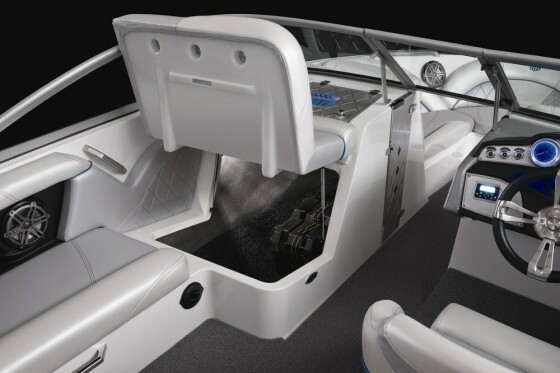 The passenger seat is noteworthy, especially for the stowage it provides for wakeboarding and watersports equipment. 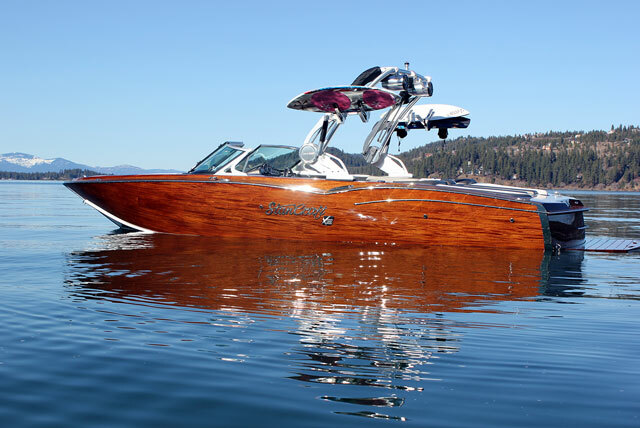 At the helm, MasterCraft makes generous use of soft-touch vinyl, knurled billet aluminum panels and switch gear. For example, all the knobs to either side of the instruments are big, for easy operation even if you’re wearing ski gloves. They’re also knurled, which makes it easier to operate them with wet hands. The stereo remote is set in its own aluminum panel to the left of the wheel and the ballast buttons are located on a panel just below the throttle. The glove box door also is machined aluminum with blue acrylic inlays of the MasterCraft logo. It’s all very spiffy. 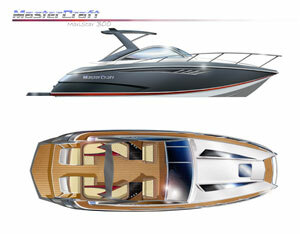 MasterCraft hasn't forgotten the passengers, either. The observer seat flips up nice and high on a gas strut with ample stowage underneath and some clever mats that absorb bumps, which protects your equipment and the boat itself, while allowing water to drain away. The seats themselves are upholstered with a marine-grade vinyl that looks like a pearlescent carbon fiber. In addition to being handsome, Boertje explained, it’s also designed for greater resistance to punctures and tearing. Probably the coolest passenger feature is the rear bench, which converts from a conventional lounge to a rear-facing loveseat that lets more people watch the action without having to twist their spines and crane their necks. Best of all, it operates with one hand. The wakeboard tower and the wind dam between the cowls also operate with one hand, which is far more, well, handy than it sounds. One character trait of a soldier is that he or she follows orders of the commanding officer. And that’s a fitting analogy for MasterCraft’s new X-10. 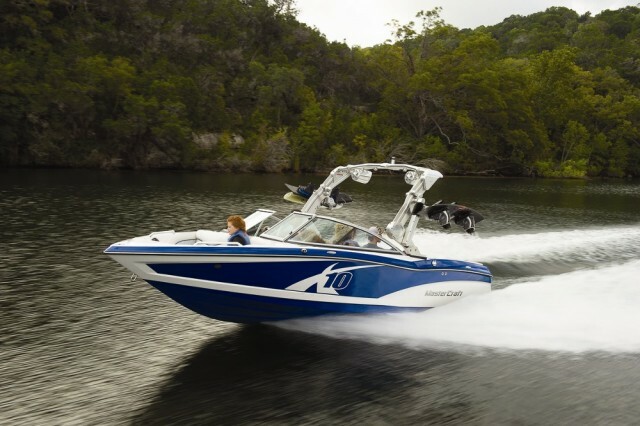 Whether it’s skiing, wakeboarding or wake surfing, it does as you command and does it well. 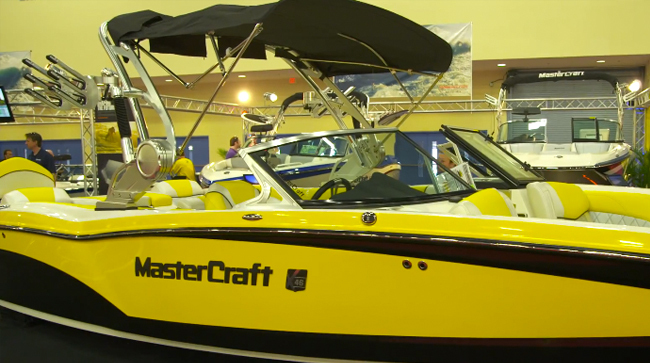 For more information, watch our Short Take video of the MasterCraft X-10 or visit MasterCraft.